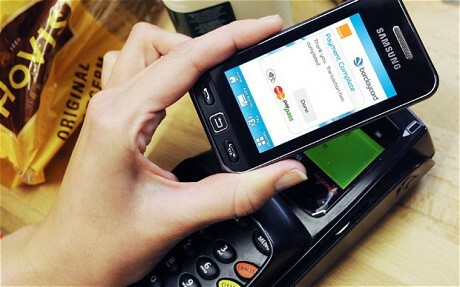 A mobile phone can now be used like a â€˜contactlessâ€™ credit or debit card. Developed by Orange and BarclayCard, the Samsung Tocco â€˜Quick Tapâ€™ is the first handset of its kind to be launched commercially in the UK. Using an app on the mobile phone, customers can top up their â€˜wave and payâ€™ account from a connected credit or debit account by up to Â£100, to a total of Â£150. The app allows a constant, running check on transactions and provides a tally of expenditure. Any losses are limited to that Â£150 total, although theyâ€™d be borne by BarclayCard rather than the customers. Jason Rees, Orangeâ€™s Director of Mobile Payments, said that the move marked an â€œhistoric dayâ€, although he acknowledged that it was a first step. Apple is rumoured to be including the necessary â€˜near-field communicationsâ€™ technology in its forthcoming iPhone and many other manufacturers have already started building it in. Orange and Barclaycardâ€™s model, however, uses a sim card-based level of security, making it more secure than current contactless cards because transcations can be verified in real time. Infrastructure to use those cards is already in place across the UK, although Barclaycardâ€™s David Chan conceded that the million transactions in the last year was a tiny percentage of the total. Transactions are currently limited to Â£15.